ATLANTA & WASHINGTON--(BUSINESS WIRE)-- Columbia Property Trust, Inc. (NYSE: CXP) today announced that it has completed more than 100,000 square feet in leases at 80 M Street in Washington, D.C., this year, highlighted by a 15-year, 68,673-square-foot lease with WeWork, one of the world's largest providers of shared office space. 80 M Street in Washington, D.C., will house a new 70,000-square-foot WeWork co-officing location and the building owner, Columbia Property Trust, is launching a $3M renovation to create a new entrance, outdoor terrace and lounge for tenants at the building to enjoy (Photo credit: APG Photography). Columbia also recently secured a renewal of Gryphon Technologies’ 24,224-square-foot headquarters lease to keep the military engineering company at 80 M Street and is also bringing defense services provider General Dynamics Information Technology to the building with a new 14,990-square-foot lease. With these leases, the 285,000-square-foot, Class-A office building, which Columbia has owned and managed since 2004, is now 85% leased. To continue this leasing momentum and anticipate evolving tenant demands, Columbia is commencing a $3 million reimagining of 80 M Street that will complement WeWork’s distinct design aesthetic and reflect the emerging urban/industrial aesthetic of the Capital Riverfront neighborhood. The renovation will create an open, collaborative environment to encourage socializing with a new entrance and main lobby and an adjacent new outdoor terrace and hospitality-inspired tenant lounge, connected via a large, garage-style sectional glass door. The project also includes updates to the elevator lobbies, fitness facility and restrooms. A dedicated entrance for WeWork within the main lobby will also be constructed. The new WeWork location, which will occupy portions of the first, second and third floors of 80 M Street, is expected to open in the third quarter of 2017. “We wanted to diversify the tenant base and create a project without equal in the submarket,” stated Doug Mueller, managing director of JLL, which is representing Columbia as leasing agent for 80 M Street and Columbia’s other Washington, D.C., property, Market Square on Pennsylvania Avenue. The Capitol Riverfront neighborhood is bordered by Capitol Hill, Navy Yard and the Washington Nationals stadium. 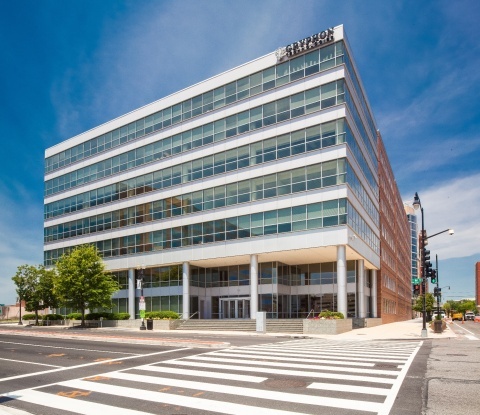 80 M Street is within walking distance of the stadium as well as numerous eateries, hotels, parks and residential buildings and offers convenient transit access via the adjacent Navy Yard/Ballpark Metrorail station. For more information about 80 M Street, please visit www.80mstreet.com. Columbia Property Trust (NYSE: CXP) owns and operates Class-A office buildings in competitive, primarily CBD locations, and over half our investments are in high-barrier-to-entry, primary markets. Our $5 billion portfolio includes 23 office properties containing 11.2 million square feet and one hotel, concentrated in San Francisco, New York, and Washington, D.C. For more information about Columbia, which carries an investment-grade rating from both Moody’s and Standard & Poor’s, please visit www.columbia.reit. Certain statements contained in this press release other than historical facts may be considered forward-looking statements within the meaning of Section 27A of the Securities Act of 1933 and Section 21E of the Securities Exchange Act of 1934. We intend for all such forward-looking statements to be covered by the applicable safe harbor provisions for forward-looking statements contained in those acts. Such statements include, in particular, statements about our plans, strategies, and prospects and are subject to certain risks and uncertainties, including known and unknown risks, which could cause actual results to differ materially from those projected or anticipated. Therefore, such statements are not intended to be a guarantee of our performance in future periods. Such forward-looking statements can generally be identified by our use of forward-looking terminology such as "may," "will," "expect," "intend," "anticipate," "estimate," "believe," "continue," or other similar words. Readers are cautioned not to place undue reliance on these forward-looking statements, which speak only as of the date of this press release. We make no representations or warranties (express or implied) about the accuracy of any such forward-looking statements contained in this press release, and we do not intend to publicly update or revise any forward-looking statements, whether as a result of new information, future events, or otherwise. Any such forward-looking statements are subject to risks, uncertainties, and other factors and are based on a number of assumptions involving judgments with respect to, among other things, future economic, competitive, and market conditions, all of which are difficult or impossible to predict accurately. To the extent that our assumptions differ from actual conditions, our ability to accurately anticipate results expressed in such forward-looking statements, including our ability to generate positive cash flow from operations, make distributions to stockholders, and maintain the value of our real estate properties, may be significantly hindered. See Item 1A in the Company's most recently filed Annual Report on Form 10-K for the year ended December 31, 2015, for a discussion of some of the risks and uncertainties that could cause actual results to differ materially from those presented in our forward-looking statements. The risk factors described in our Annual Report are not the only ones we face, but do represent those risks and uncertainties that we believe are material to us. Additional risks and uncertainties not currently known to us or that we currently deem immaterial may also harm our business. Source: Columbia Property Trust, Inc.